I had a kick a** time throwing down and painting with the crew!! The W Hotel offers three different party atmospheres to get your groove on! In the Living Room DJ’s Ian Dunn & COCO spun up some Techno and Tech House to get the dance juices flowing, while in the Veranda DJ’s Tramlife and L threw down the best Hip Hop your ears will ever hear. 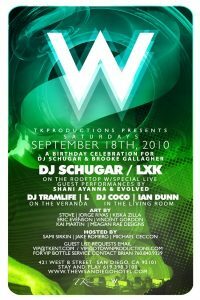 Hold on a second, on the Rooftop, Birthday boy DJ Schugar along with LXK spun the very best Techno and Tech House with Special Live guest performances by Shani Ayanna & Evolved. What kind of party would this be without some visual stimulus? Don’t worry, that was covered. Infusion artist’s Kiska Zilla, Kai Martin, Eric Evenson, and Vincent Gordon will be on hand with fresh new artwork, plus artist Monty Montgomery joined on with Stove and Jorge Rivas throwing down some wicked work themselves.